It is an undeniable fact that choosing just right bedding can make your bedroom a haven of comfort. The style, size and shape of pillow and duvet that you choose would define how peacefully and comfortably you’ll sleep all night long. The kind of bedding that you choose depends on your sleeping habits and many other factors, which is why not all beddings are comfortable for everyone. Now that you have got your home constructed and decorated by a topnotch Pakistani construction company like AmerAdnan, it is time for you to make it more comfortable by buying the right bedding. Buying the right duvet involves many important things that need to be taken into consideration. Tog Rating: The tog rating that is mentioned on a duvet’s packing defines its softness and its ability to trap warm air. The duvets with higher tog rating have ability to keep you warmer. The duvets with the tog-rating from 2.5 to 7 are ideal for spring, whereas those with rating from 10.5 to 13.5 are good for the winters. Many leading duvet brands have a fill power mentioned on their packings. It will tell you about the volume a duvet can occupy when it is filled, but it varies according to the quality. The duvets with higher fill power are cozier and warm. The fill power ratings fall between 345gsm and 750gsm. The duvets most commonly come in a boxed wall construction. In this type of construction, the filing is held in each box which allows you to evenly distribute it and prevent any cold spots. Also, it’s good to shake your natural duvets from side instead of shaking them from the bottom as it will ensure extra comfort and quality. Or you can opt for duvets with No mite cases that guarantee no feather escapes. The duvets come in different types of filings of which the most popular are natural fillings and synthetic fillings. 1: Natural Fillings: The duvets with natural filling are lightweight, soft and very comfortable. The natural fibers in these duvets allow easy breathing. Moreover, the natural fillings are long lasting and offer better warmth. 2: Synthetic Fillings: The synthetic fillings are also as warm as the natural fillings, but they do not comprise natural fibers. All those people who are allergic to feathers should opt for duvets with synthetic fillings. Moreover, the duvets with synthetic filling are washable and dry easily as compared to those with natural filling. Just like the duvets, the pillows also come with natural fibers as well as synthetic fibers. 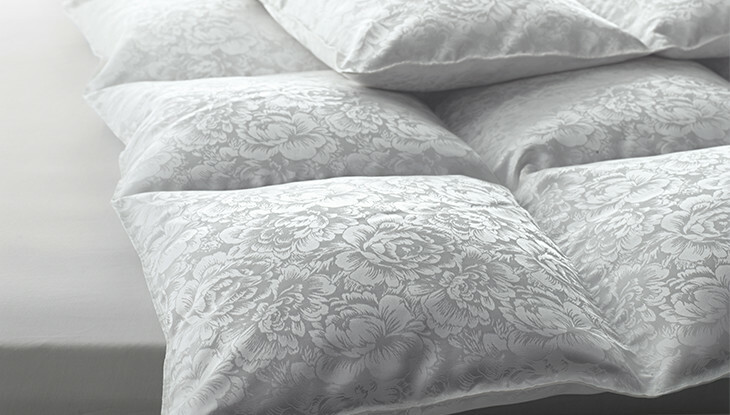 The pillows with natural filling mould cozily around the head and the shoulders. The more feather you add to a natural pillow, the firmer it would be. Besides, there are pillows with synthetic filling that provide a great alternative to pillows with natural filling. They are more suitable for people who are allergic to feathers and down.